Posted by pacejmiller in Taiwan, Travel. Taiwan is generally a pretty low-cost place for shopping. According to my classification system, there are two types of cheap in Taiwan – ‘normal’ cheap and ‘super’ cheap. Normal cheap refers to the lower price of the exact same product you pay in Taiwan compared to the price you would pay in another country (eg you may pay say $300 for a pair of jeans in Sydney but pay only $180 for the exact same pair in Taipei). Then there’s super cheap, which refers to the substantially lower price you pay in Taiwan for a product of roughly the same type and/or quality, or a product that doesn’t even exist in another country (usually household products, essentials, etc). 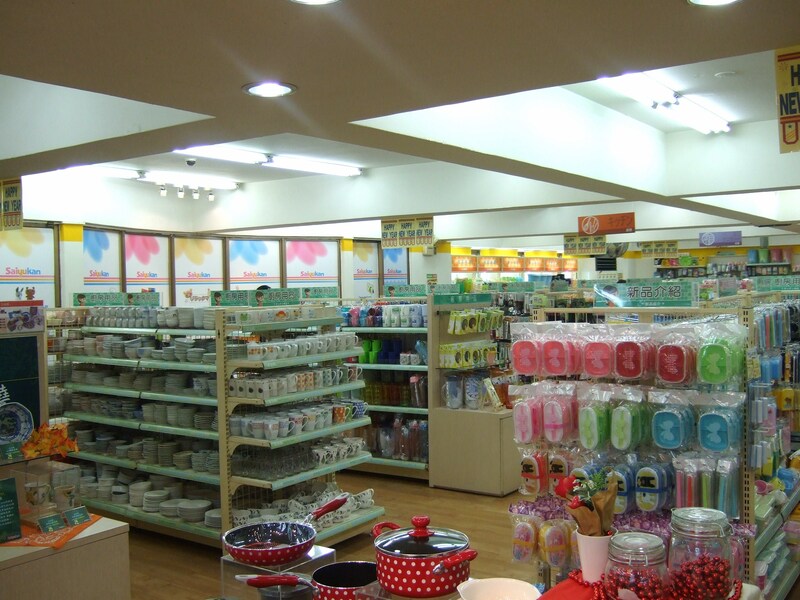 There are plenty of bargain stores in Taipei that sell these super cheap household products. 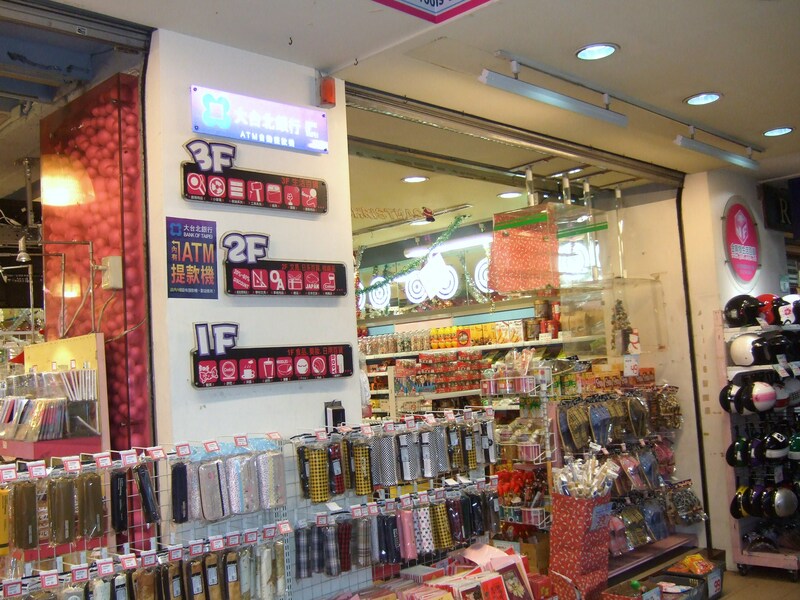 Think your typical $2 shop in Australia or Poundland in the UK – except these shops in Taiwan are absolutely massive and significantly more comprehensive. 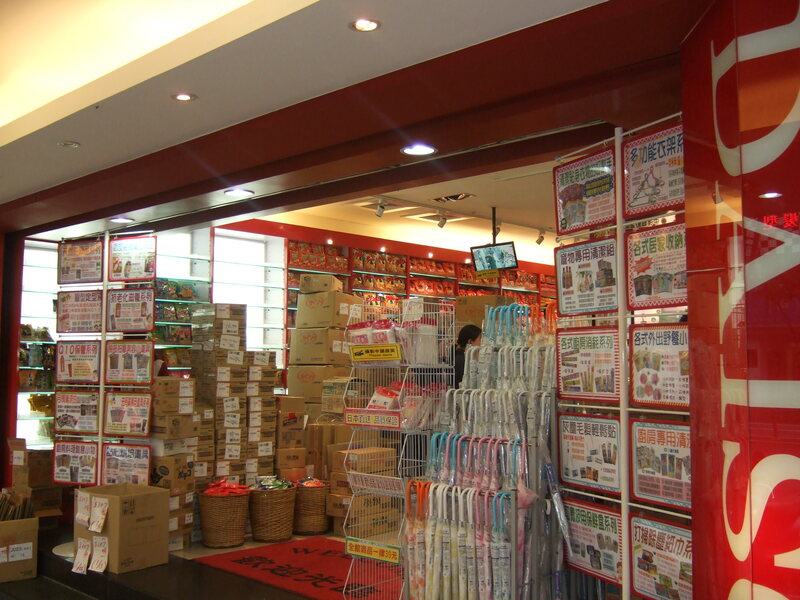 They are like one-stop shops for your daily living. You can get food (mainly snacks and drinks though), cosmetics, hair wax, shampoo, hand creams, stationery, DVDs, computer games and accessories, headphones, underwear, toys, cleaning tools and products, car accessories – pretty much anything you can think of, except at a quality and price you would not expect to be paying for. When I visited Zhongshan MRT station (on the red line), I came across three such stores along the main road (Nanking West Road). The first is the Japanese store Daiso, which sells everything (and by this I mean everything) for TWD 39. That’s USD 1.22, AUD 1.33 and GBP 0.77. I can’t think of a place in the US, Australia or the UK that would sell the most of the things they stock at Daiso at even half that price. 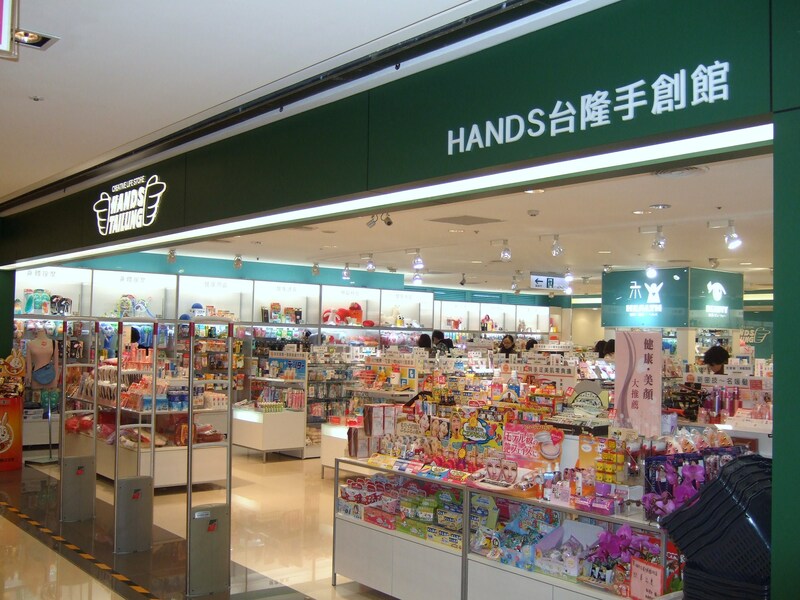 There are plenty of Daiso stores in Taipei – check out this website for the list (if you can read or know someone who can read Chinese). Apart from the one near Zhongshan MRT (exit 4, turn left), I know there is one right across the road from Taipei Main Station, and another one on the 11th floor of Ming Yao Department Store (which is right near Zhongxiao Dunhua MRT station). 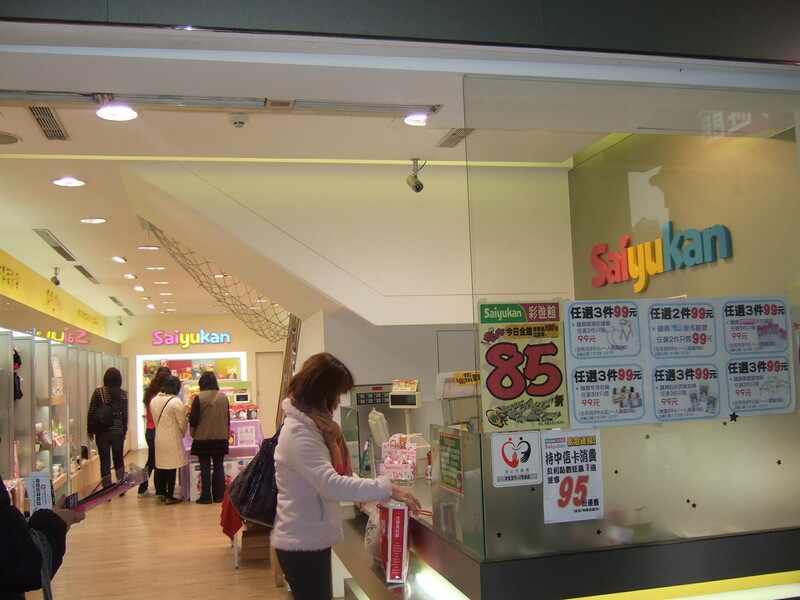 The second is Saiyukan, a similar store, but one that does not limit its price. Accordingly, you can find slightly higher quality and more expensive goods there (including some quirkier products), though the price will still be, relatively speaking, dirt cheap. Here is the Chinese link for all the Saiyukan locations. Apart from the one near Zhongshan MRT I visited (exit 1, turn left), I know there is another one near Sun Yat-Sen Memorial Hall MRT station (blue line) – take exit 1 and turn right. The third is known in English as JSF, and the one I went to near Zhongshan MRT station (exit 4, turn left, just up the road from Daiso) had like 5 floors of stuff. Very similar products, but also no limit on price. 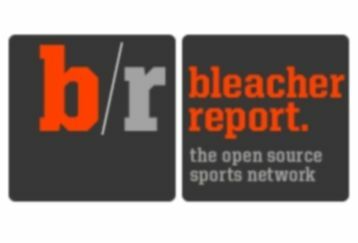 It’s worth checking out though because JSF is probably the most comprehensive of the three. The JSF website is here (only Chinese again). I understand there are three stores near the Shida Night Markets (which I will review later). There is another local store which sells a lot of cool, creative and innovative stuff, but it’s not a ‘bargain’ place per se because the products are not ‘super’ cheap. It’s called Hands Tailung and you can check out its Chinese website here. There are heaps of them around. I visited one on top of Taipei Main Station, saw one on level 10 at the Zhongxiao SOGO and another on level 8 of the Fuxing SOGO, and one on level six of Breeze Center (5-10 minute walk from Zhongxiao Fuxing MRT station). Anyway, I wholeheartedly recommend these bargain stores for visitors to Taipei. You can easily spend half a day in some of these places because they really have some cool products. You can buy a whole basket load of stuff and still not spend much money at all!